Remodeled old hay barn with all conforts, 4 double bedrooms with bathroom. You can also rent a single room or the entire apartment complete with kitchen and living area. It is located atop a hill in the countryside at the foot of the Nevegal and the Dolomites, the owners live in the adjoining house also newly renovated. 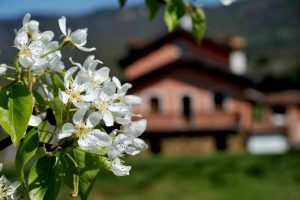 We can offer a rural experience in complete tranquility, just 1.5 km from the village of Castion or 6 km from Belluno, Vegetables garden, horses, walks, local products at km-0, Overlooking the small village of Pittanzella where you can buy fresh eggs and fresh milk. Beautiful panorama of Nevegal south, the Belluno Dolomites to the north and the entire Valbelluna. Great place for grilling and barbeque with family and friends. We are along the bike path and high path of the Dolomites Monaco / Venice. Contact us for more information and reservation!! We spent 10 days in Belluno and had one of the nicest vacations there. even with the rain there was enough to do in the area, wine tours, the dolomite mountains and even Venice is an hour away (easy and cheap with the train). So you can hike, climb, mountain bike, but you can also just enjoy the view with some good wine and cheese (really try the cheese of the village there very good!). The owners are very nice and if you need some tips were the best seeing trips are they were very helpful. The house is nice and comfortable you have everything you need. One of the best Holiday i had!!! Thank you paolo and Nicoletta for everything, we really had a nice stay!!! Having spent time at the Vena D'oro B&B turned out to be one of the best experiences my wife and I ever had, and like the name of the house implies, we found our vacation vein of gold. The Colle family, hosts of the house, were very friendly and ready to help in any possible way, moreover, everyone speaks very good English. This neat house is set in front of the magnificent rocky Dolomiti mountains that can change color accordingly to the weather creating an incredible showcase of nature that made us feel very humble. No wonder why those mountains are part of the UNESCO world heritage. The location is a very good starting point for any open air activity, in fact just a short distance away there are several itineraries for trekking, mountain bike, and many facilities for the the ski lovers. The city of Belluno nearby, differently from other chaotic cities in Italy, its a gem of tranquility while offering an interesting history and several cultural options. Cortina d'Ampezzo frequently visited by many world VIP'S is only 27 miles away and can be comfortably visited in one day. I think this is a place for all seasons and I recommend it to friends and relatives. My wife, son and I, have been staying for 3 days at this location. The location is wonderful, surrounded by mountains and great views. Very peaceful. The Dolomiti Alps in Italy are wonderful in the summer and great for skiing in the winter. Now they are part of the Unesco world heritage. The hosts (Colle family) are an Italian family that is exceptionally friendly. They have lived in the USA for many years so the language skills are excellent. I would recommend to anyone. My family of six stayed at Vena D’oro last November. From arrival to departure we were treated like family. The location is breathtaking , the property building is very nice and very clean, with great views out of each room, especially the master bedroom. Service was extraordinary when Paolo and Nicoletta prepared fantastic meals for the six of us, of course with all the ingredients from their farm or neighbor's farms. Chiara showed her horses to my kids while Gaby took them on a bike ride. This was our first agriturismo experience and we could not have asked for more. We have never felt as welcomed as we were at Vena D’Oro. Amazing service, Tasty food, Great location, Wonderful family. Look forward to doing it again and again and again ….see you soon! If you want to get away from the rest of the tourist and experience Italy to the fullest, this is a must visit. The owners, Paolo and Nicoletta, speak English which makes it easy for those who do not own Rosetta Stone yet. They are incredibly friendly and hospitable and can recommend loads of fun places to visit and fun things to do, from wineries to local restaurants, skiing and fishing, hiking and on and on. I must say, if you decide to opt for full board, you have just landed in the absolute best restaurant in Italy. Nicoletta is an amazing cook and Paolo can put together a nice spread like you have never seen. I promise, you will think you too are Italian and you will not want to leave. Great relaxing vacation, one of a kind for sure! Thank you guys for such a wonderful time. We were so comfortable, the kids had a great time, and the location is fabulous. We can't wait to return. If you are going to be traveling to Belluno, Italy I would high recommend staying at Vena d'oro. The owners are extremely hospitable and lived in the states so they speak English very well which is a plus for the American traveler knowing no Italian. The accommodations were far above what I expected, with many rooms and a full kitchen. Paolo, Nicoletta and their children run Vena d'oro and do everything possible to make sure your experience is fabulous. While our family stayed at Vena d'Oro we visited wineries, local restaurants, Venice, hiked the dolomite mountains and took many relaxing days just walking around Belluno experiencing the beauty that the city had to offer. Being able to stay at Vena d'Oro really gives you a true Italian experience rather than staying in a normal hotel. You are able to feel like an Italian while on vacation and are able to socialize with Italian natives. This was the BEST trip I have ever taken in my life and I strongly believe the reason it was the best was because we stayed at Vena d'Oro and had the advantage of getting advice and tours from locals. It was extremely homey and I will be going back to Vena d'Oro at the first chance I get! If you want to experience Italy away from the tourist traps, I highly recommend that you visit this lovely area just 1 hour north of Venice. The owners grew up in this area but lived in the US for 20+ years. They understand the needs of Americans and the desire to see the Italy they love. Paolo Colle is the owner and a FUN host. He can help you customize a vacation ANY way you want it. He's a kid at heart and can plan many fun things. He knows every winery, castle and out of the way incredible restaurant you can imagine. The house is lovely, comfortable and tucked in a hillside with an incredible view. We sat and drank coffee while watching an international sky-diving show for an entire weekend...all from the front yard. Call Paolo and discuss your trip. I promise that you won't be disappointed.